including microbial activity, uptake of nutrients and plant growth. 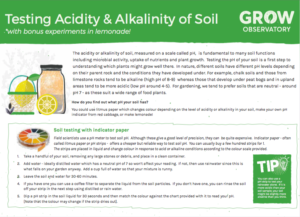 Testing the pH of your soil is a first step to understanding which plants might grow well there. In nature, different soils have different pH levels depending on their parent rock and the conditions they have developed under. For example, chalk soils and those from limestone rocks tend to be alkaline (high pH of 8-9) whereas those that develop under peat bogs and in upland areas tend to be more acidic (low pH around 4-5). For gardening, we tend to prefer soils that are neutral – around pH 7 – as these suit a wide range of food plants. View the full instructions here.